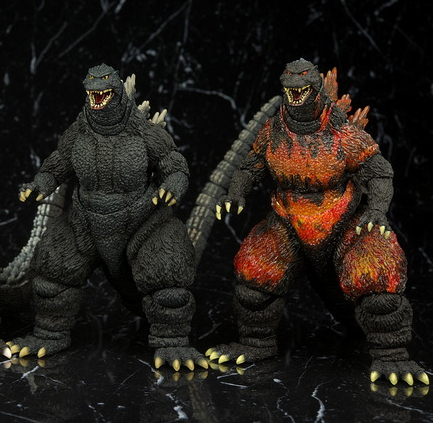 Specialty: the best Godzilla figure maker/designer Yuji Sakai oversaw the design & coloration. 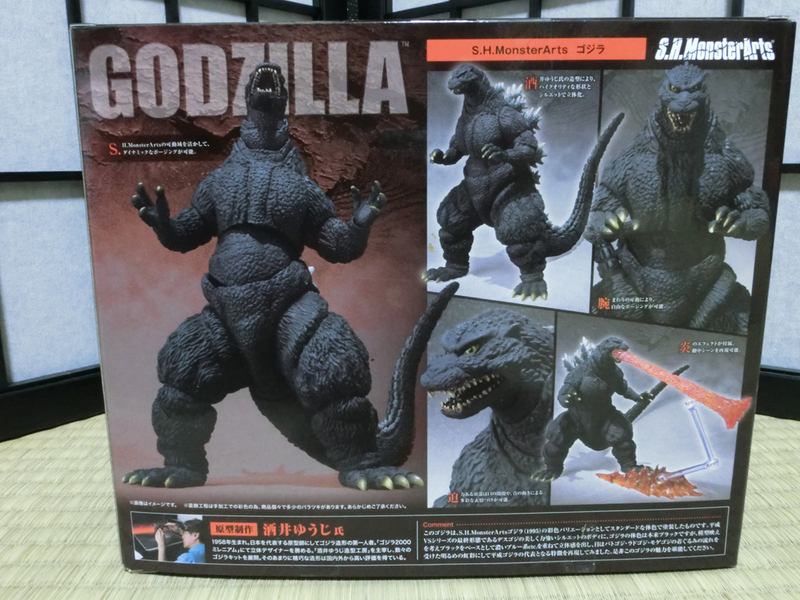 The model for this figure is very mysterious as it is rarely shown in the Godzilla movies. 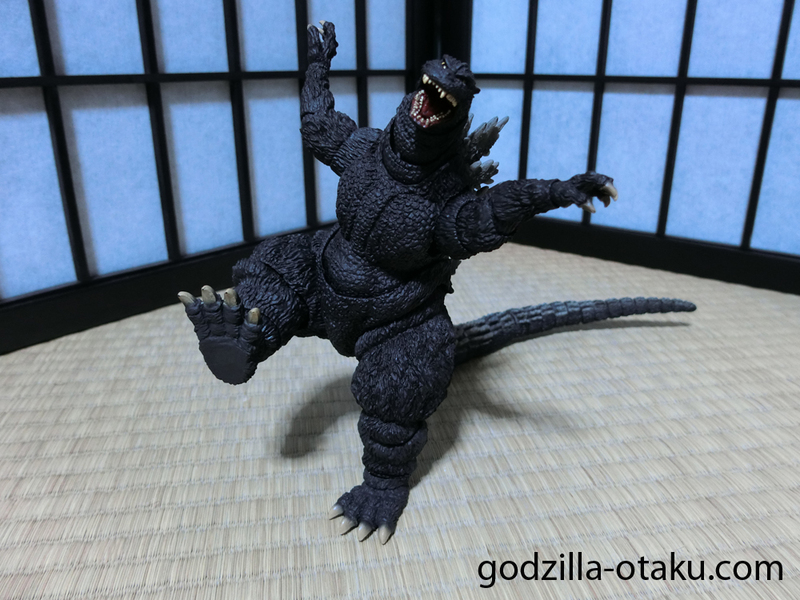 Even I did not know that which movie this Godzilla was in till I found information of the figure on the official website of Tamashii Nations, the Godzilla figure store. 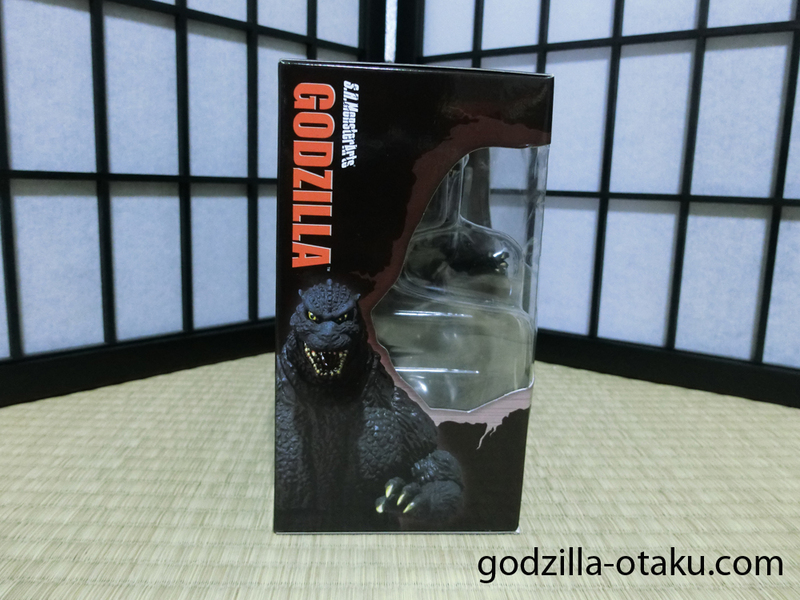 It turned out this guy shows up only during the last few seconds of the film, “Godzilla VS Destroyah”. 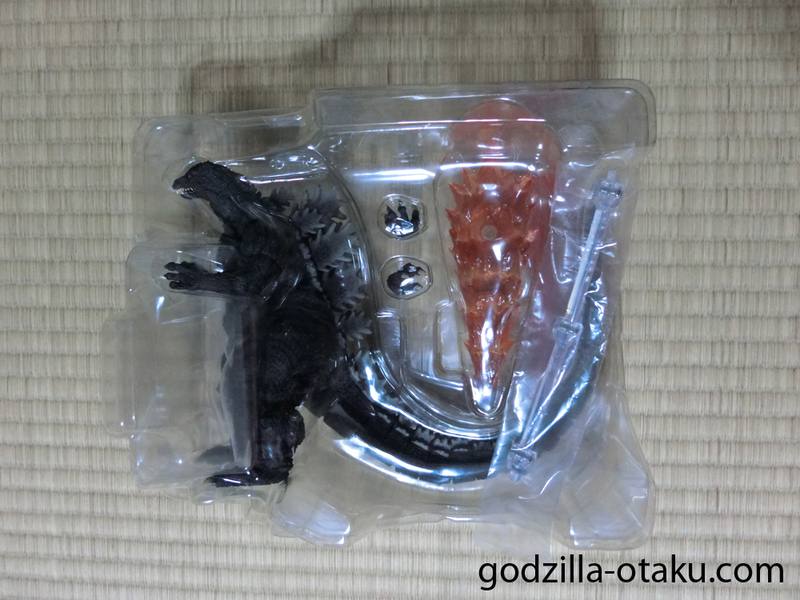 And only his silhouette is shown. 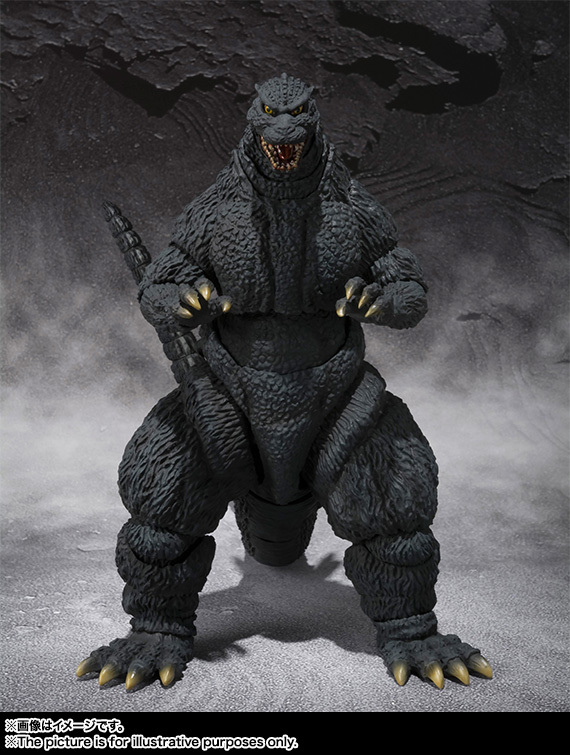 In the movie Godzilla Junior absorbs the residue(power) of his father(Burning Godzilla) after his meltdown and transforms into this Godzilla. 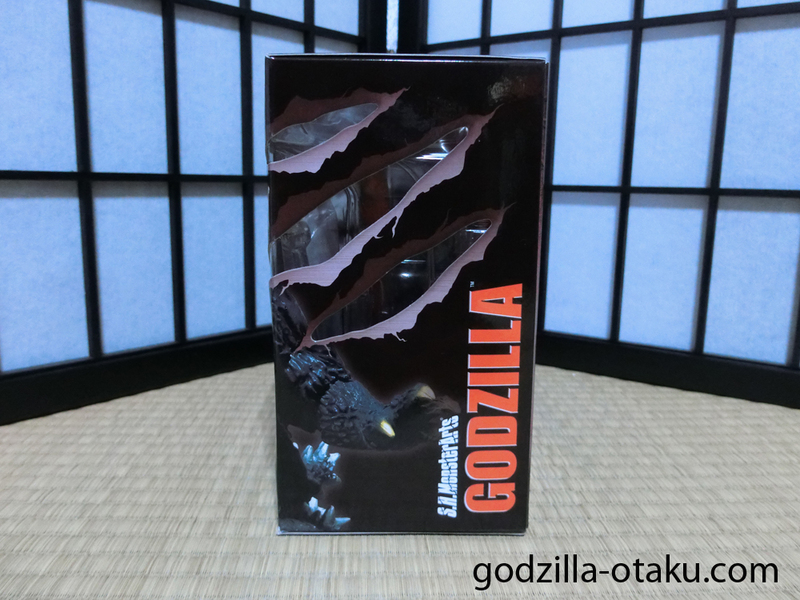 Overall box design is cool as there are patterns of scratches by Godzilla’s claws on the top and side. The front of this box is partially transparent so you can see some parts of the content inside. 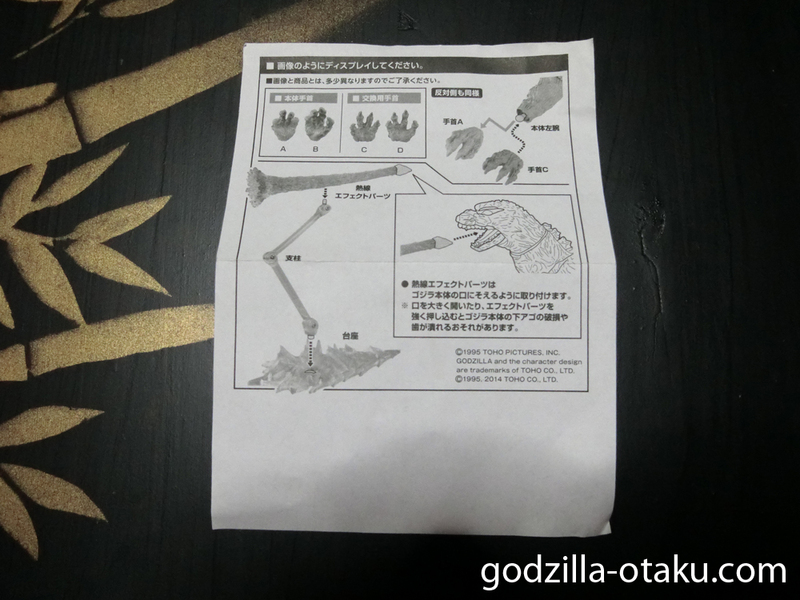 On the back side, there are some illustrations of the figure and a story about Yuji Sakai and his works. 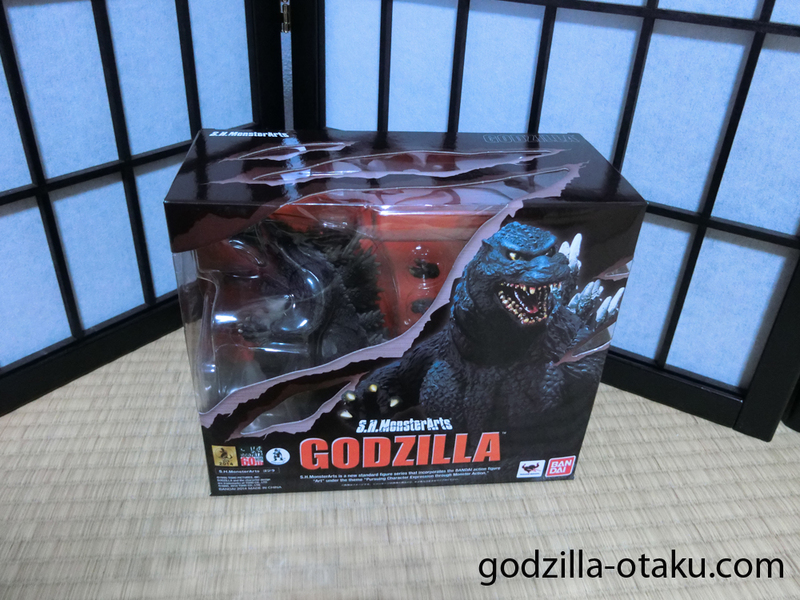 Okay, I am opening this box! 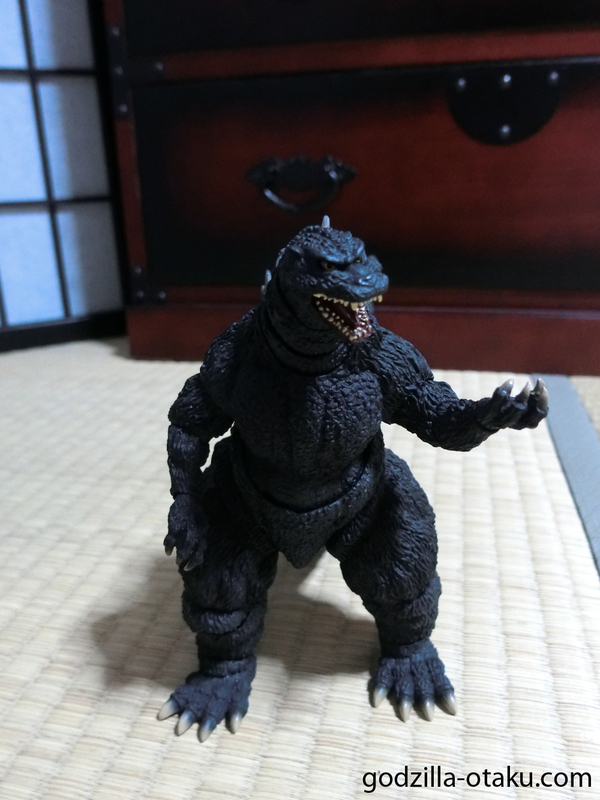 About the faithfulness to the film, actually I am not sure…(actually nobody is except the character creator!) 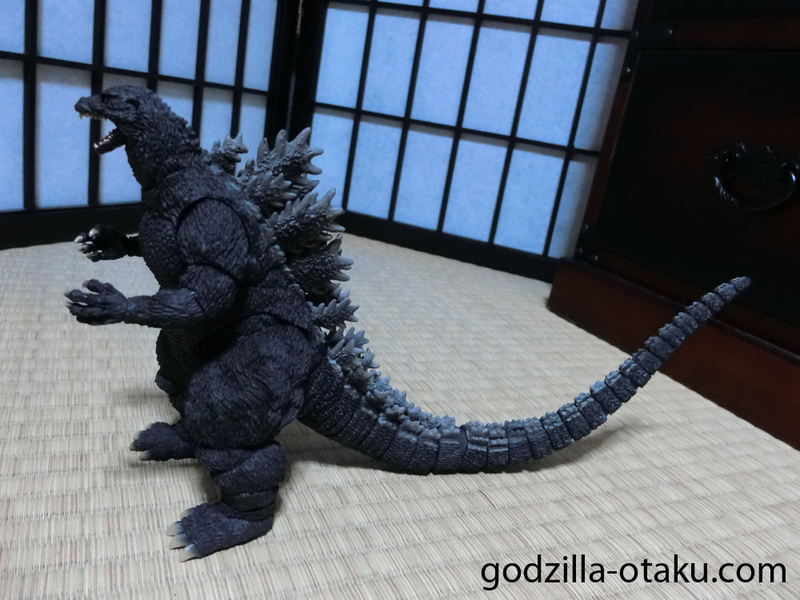 because we can only see the shadow of this Godzilla in the last few seconds of the movie! 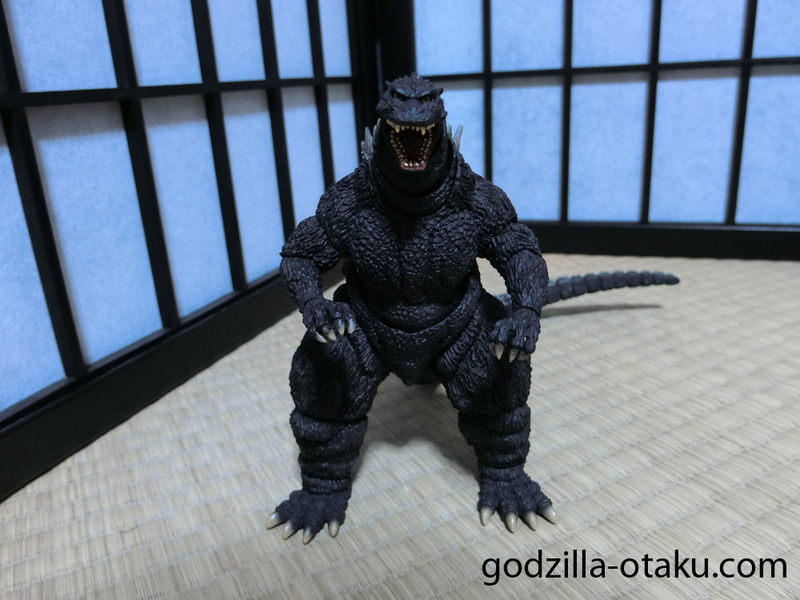 This figure is a recolored and upgraded version of the Burning Godzilla figure (I guess the designer thought that this figure should be similar to those of burning Godzilla as Junior Godzilla absorbed him in the film). 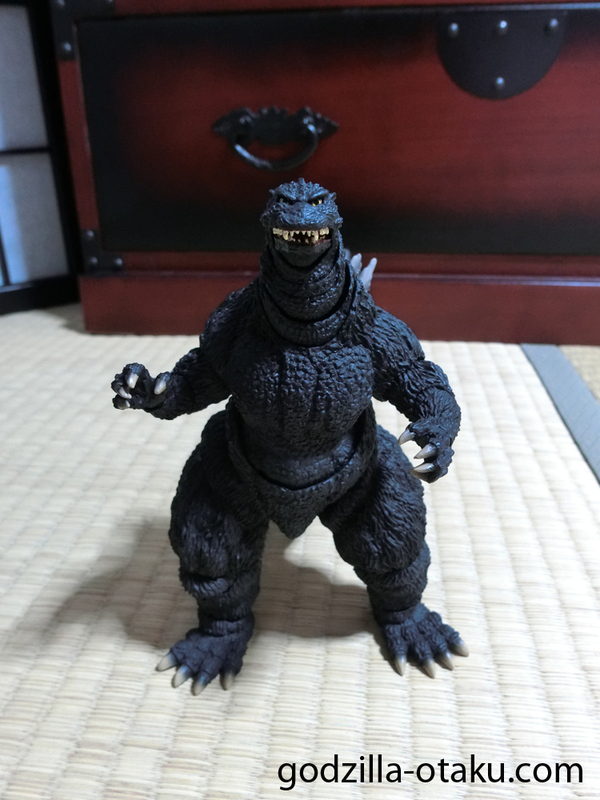 But I can say this figure is very faithful to the standard Heisei Godzilla which is characterized with a small handsome head, two rows of teeth, and chunky thighs, as you can see (of course! 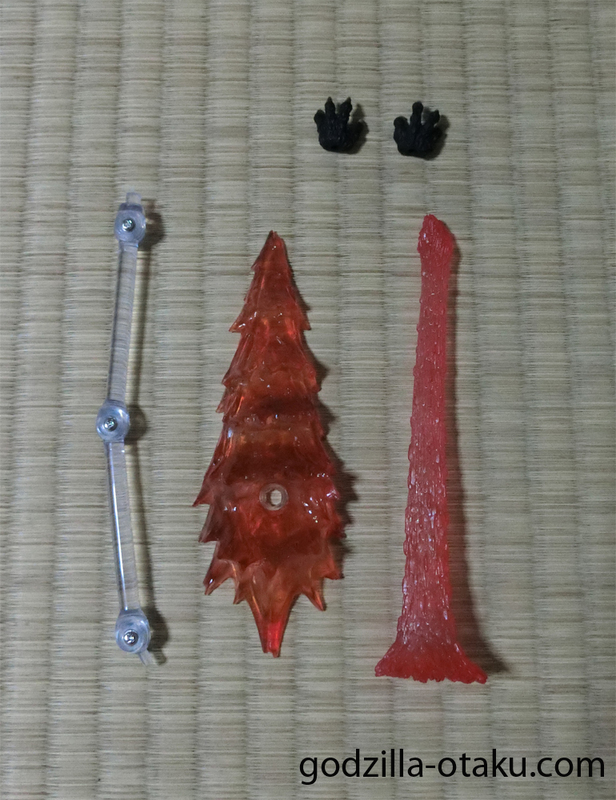 this is Yuji Sakai’s work!). 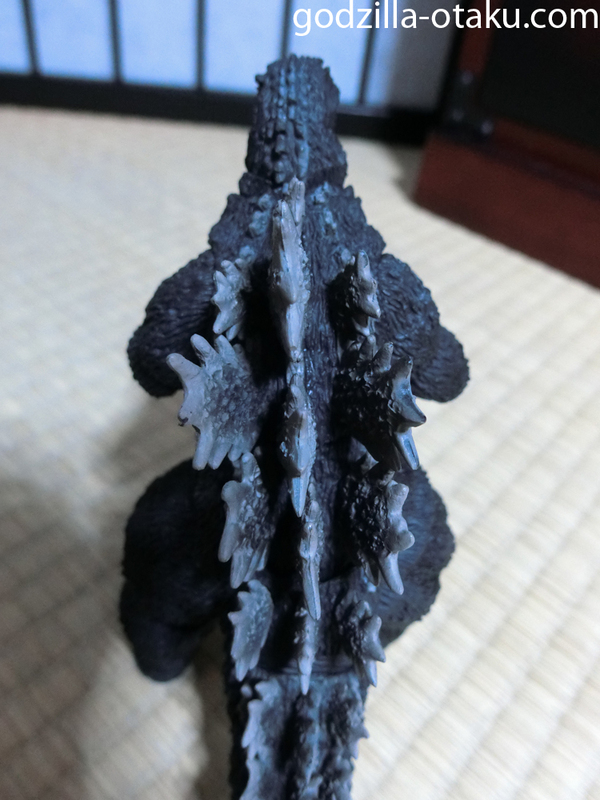 Particularly the tree bark skin texture and the texture of the dorsal fins are very detailed and clear. 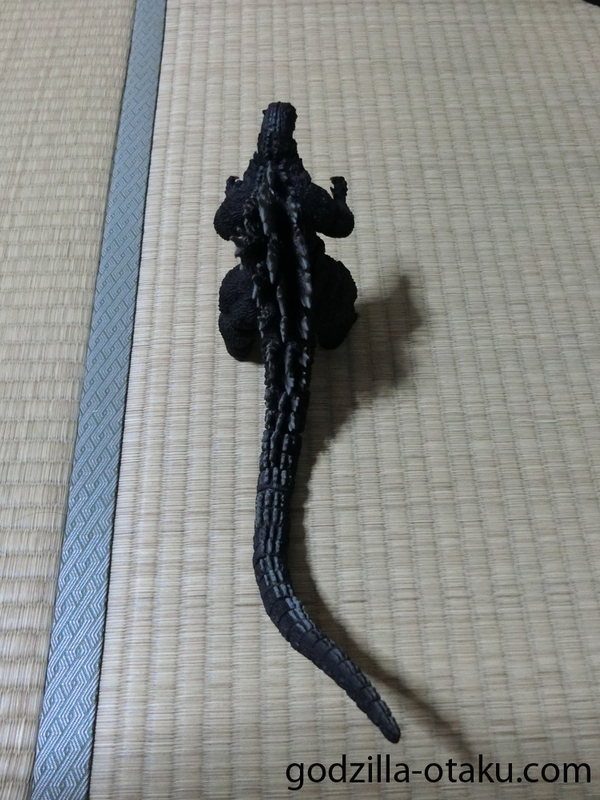 Also the body’s coloration of reflective black (unlike some other figures of dusty or matte colors) makes it look like a real reptile which is so cool! 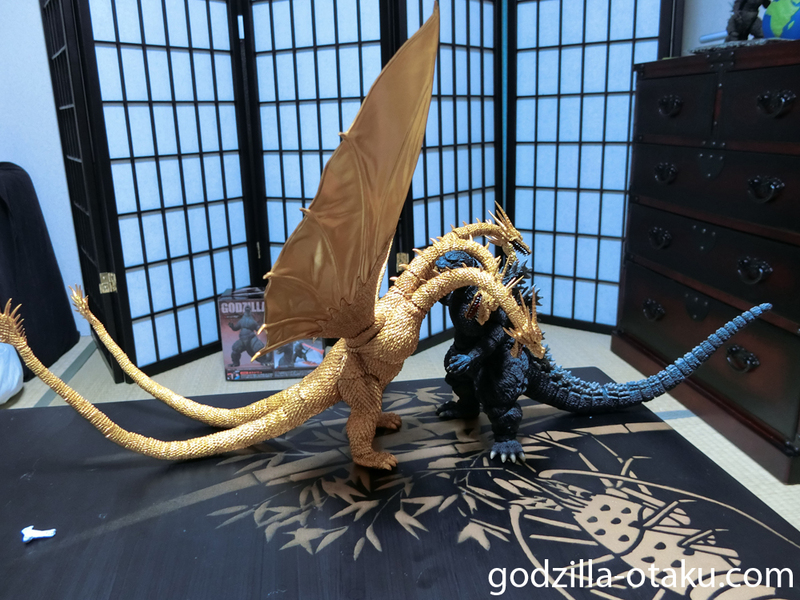 I appreciate the color gradations that Mr. Sakai put in dorsal fins and claws, naturally connecting the color of them to those of the main body. 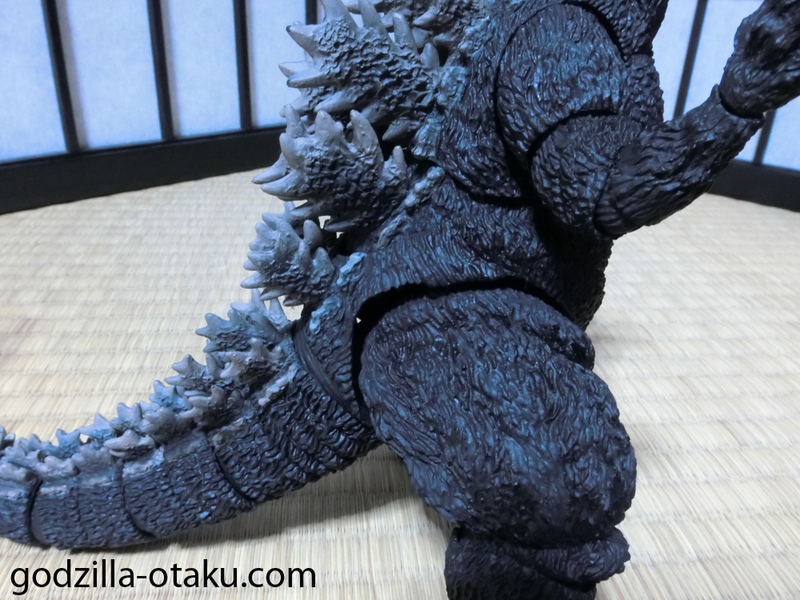 The claws and fins are detailed in texture as well in comparison to other Godzilla figures. I also love this guy’s handsome face. Eyes are not derpy and focused like a wild predator. 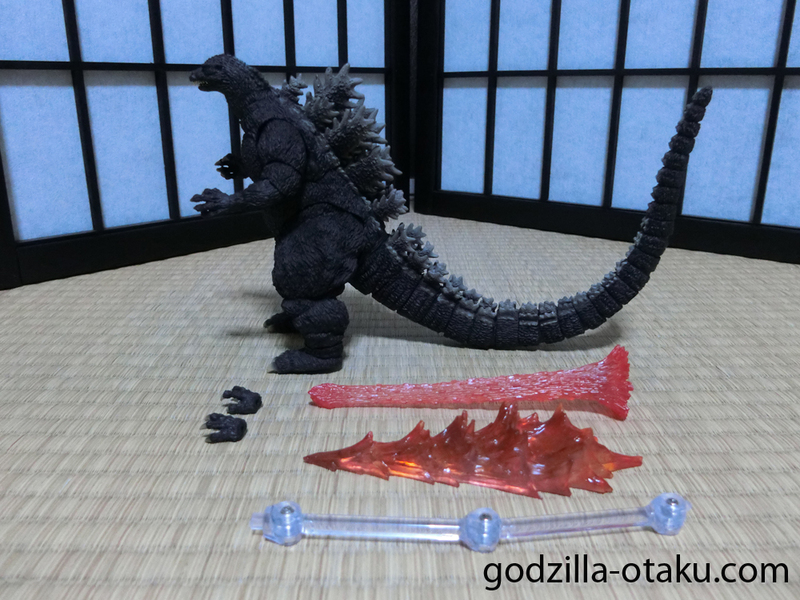 The teeth are a little dull for kaiju, but considering the size, good enough. I can see two rows of teeth clearly. 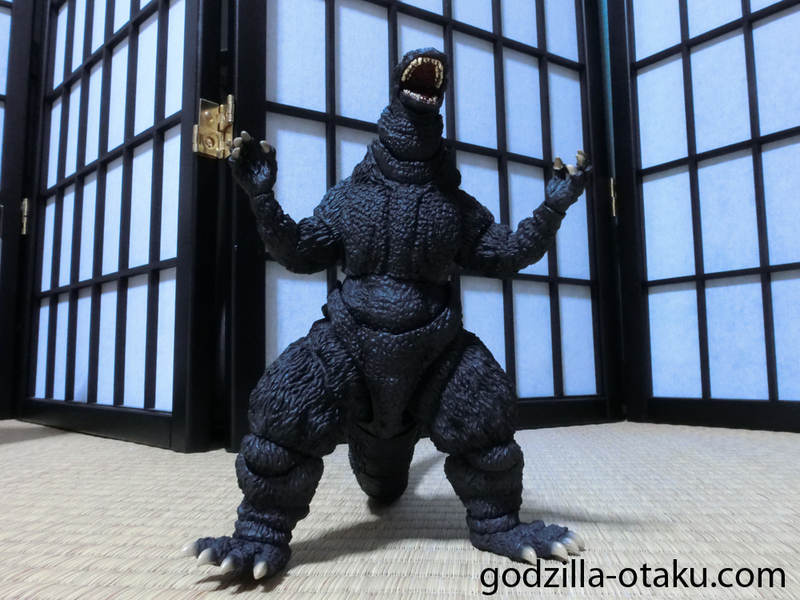 This action figure works his job well with its quite excellent articulation! 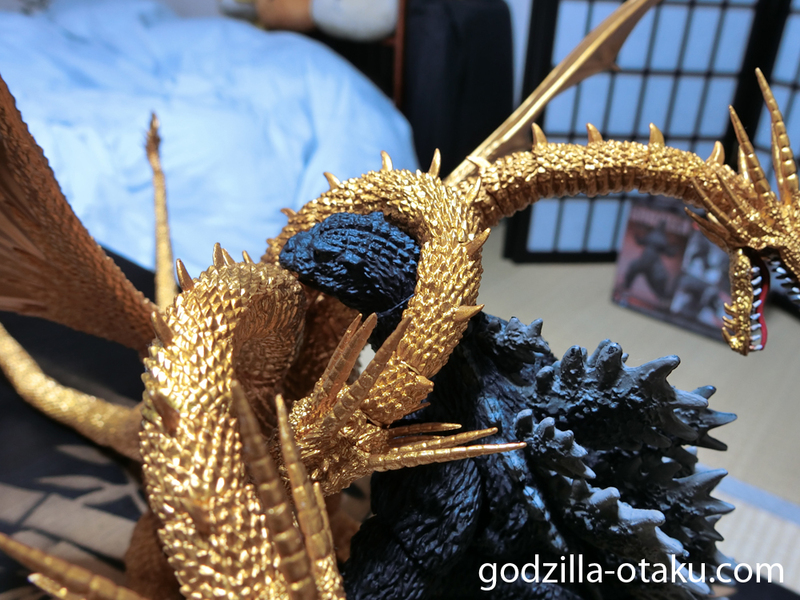 I have spent time trying many poses with this guy for a while today, and I really enjoyed it. 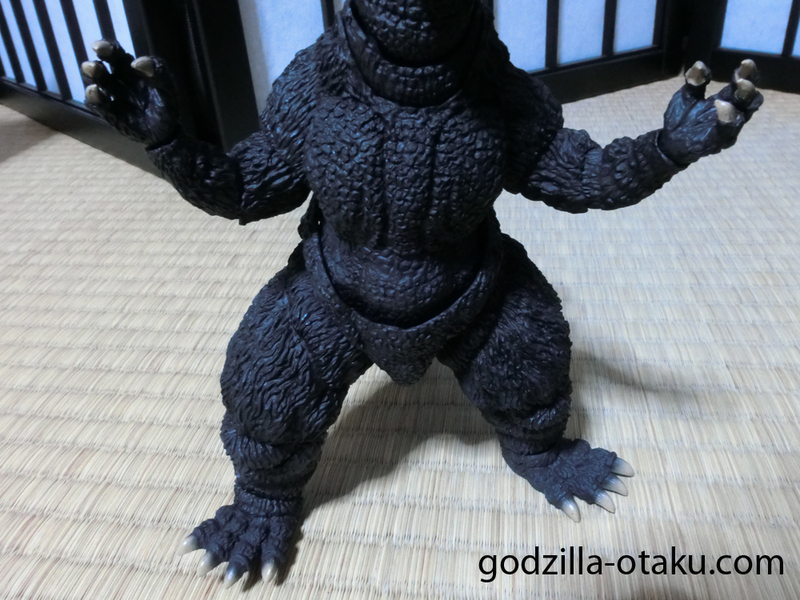 The joints are not too loose and not too tight, so it’s easy to make various poses but still in good shape. 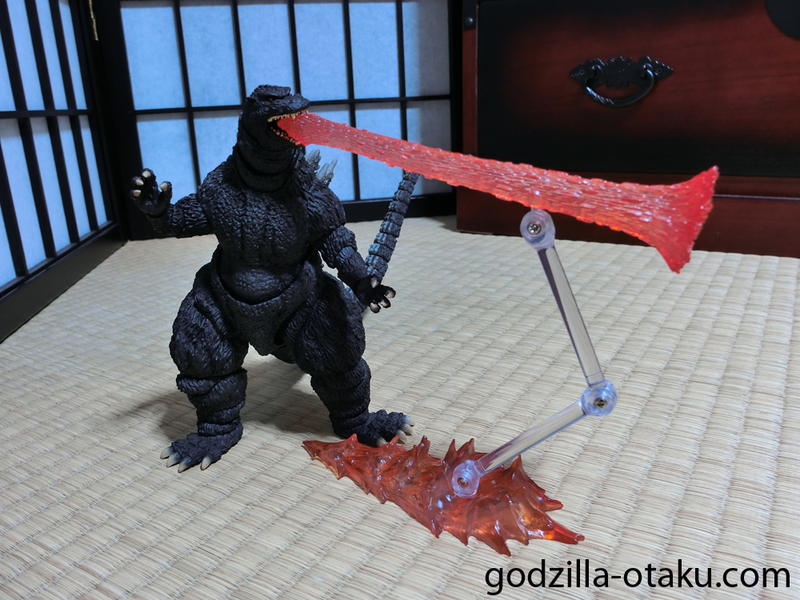 Arms and legs have several ball joints, and you can spin around each of their parts. 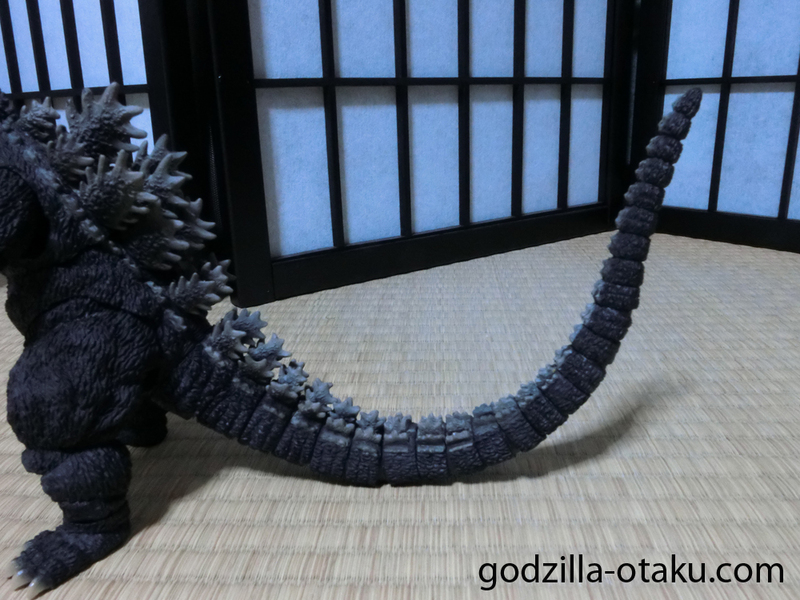 You can also easily swivel around the main body and neck up/down and left/right in some angles. 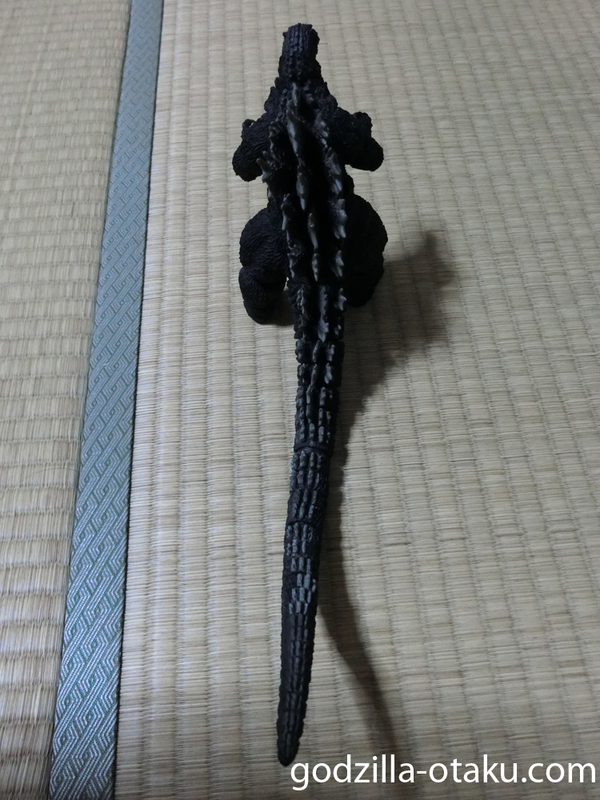 However, even though the tail is quite posable and looks good enough, you can’t move every part of the tail. Last 9 segments of tail are attached to each other and non-movable. 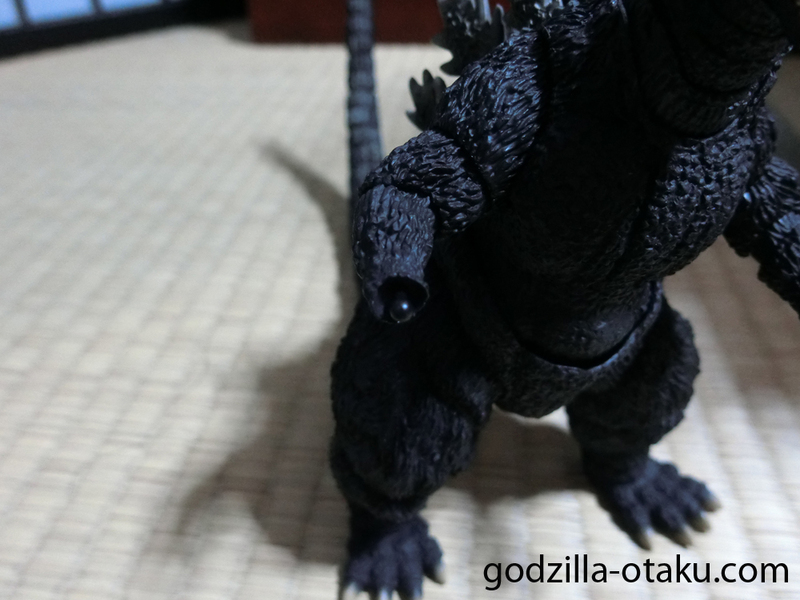 You can see some gaps between the pelvis and ab and thighs, but it gives good articulation to this figure. So you know, no pain, no gain. 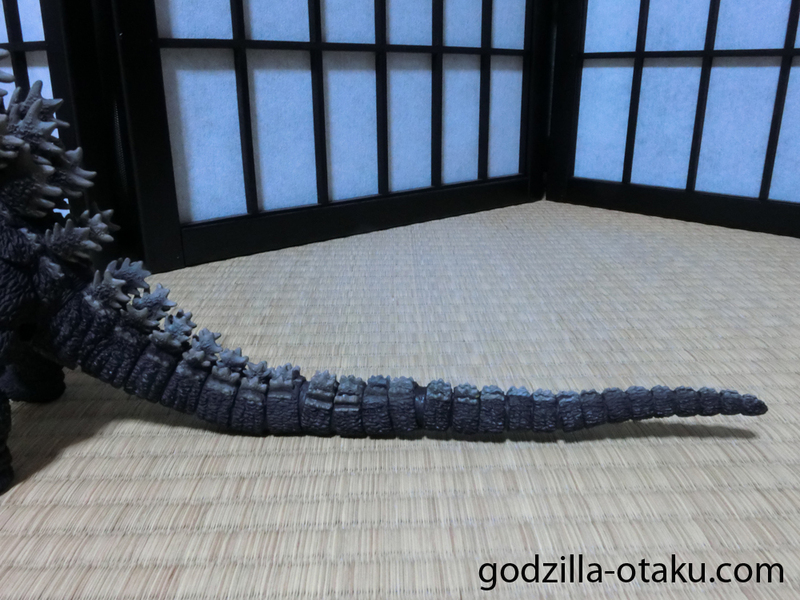 Watch this Youtube video below to see more of the articulation and coloration of this Godzilla. 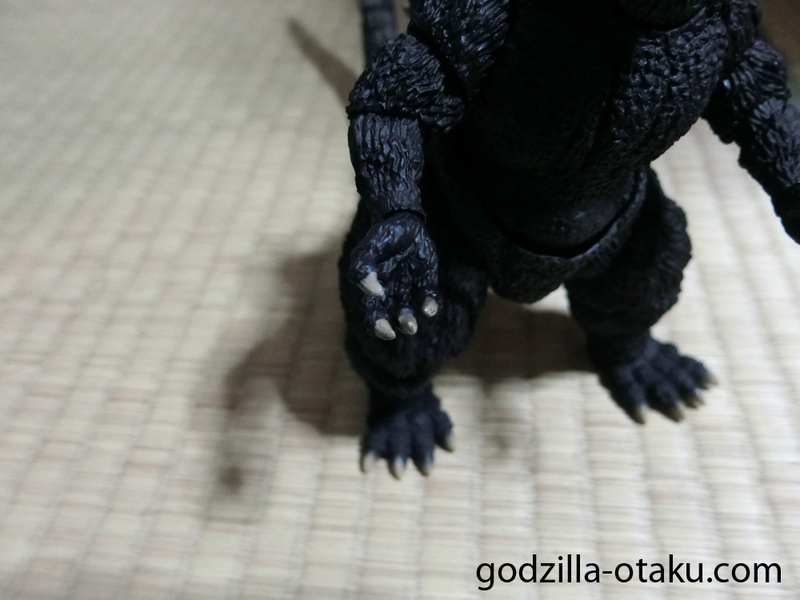 You can swap out basic closed hands with this little splayed hands. And…this could be interesting. 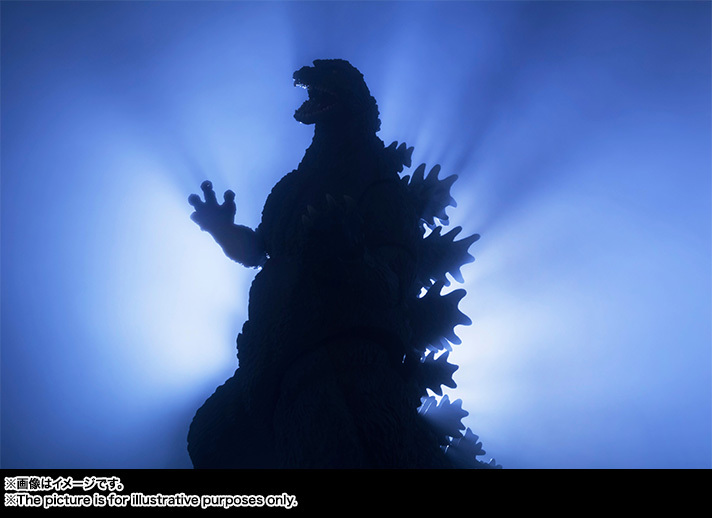 Even though there is no scene of this Godzilla radiating atomic breath(the red breath, not blue, which makes it more interesting), you can make your own new scene with this breath effect. 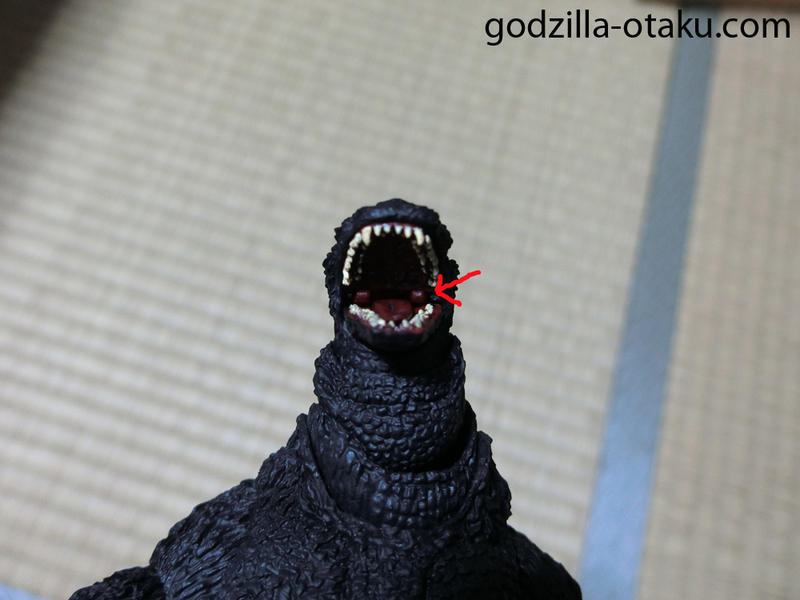 ..is this mouth part. 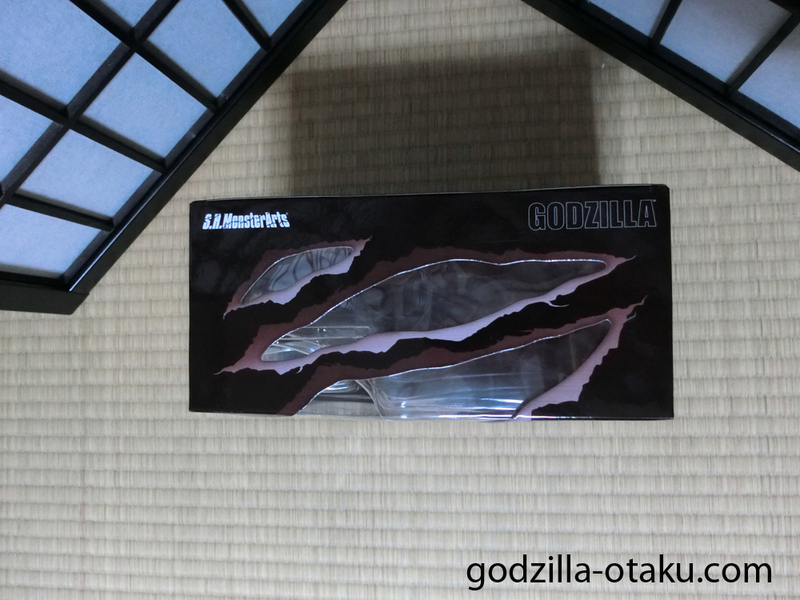 It is hidden very well in its mouth but if you carefully check inside, you will see these hinges below. 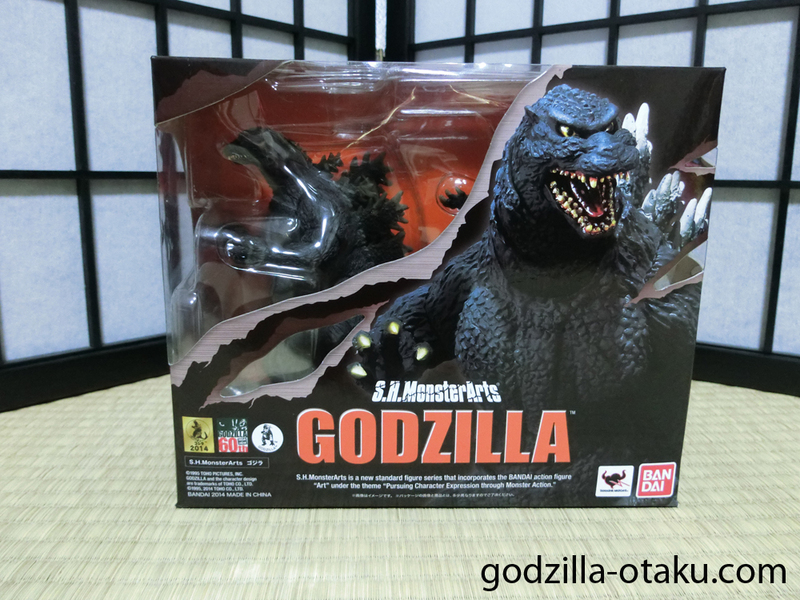 Previous Post:Welcome to Godzilla Figure Otaku!